Exploding buds and erupting flowers are natural spring “sounds.” They are silent sounds, to be sure, but crucial to understanding the season. I suppose an opening tree bud would literally sound like an explosion to a microbe, but for the sake of this discussion it really doesn’t matter. No human explanation of the season is complete without the use of these descriptive pseudo sounds. Spring doesn’t just “show up”, it “arrives!” I would like to add one more non-auditory spring sound to this slightly meaningless thought string. A booming population of Water Fleas heralds in Spring just as “loudly” as the buds and blooms. Water Fleas (see above) are mini aquatic crustaceans cursed with an unfortunate name. Because they are tiny and happen to swim around in a jerky style reminiscent of hopping fleas, they are commonly called “fleas.” They are actually members of a group known as the Cladocerans and are more related to crayfish and shrimp than to cat parasites. Populations of these creatures literally – or is it figuratively – explode in the springtime. Dormant winter eggs are called into action as the days lengthen and the temperatures warmen (I know that’s not a word, but it should be). Nearly every body of water, from stagnant pools to the open waters of the Great Lakes, suddenly harbor trillions of these eruptive little life forms. The boom subsides to a rumble by summer, but while it lasts their collective mass probably outweighs the collective weight of every other creature in the water – including the fish! Water fleas are exceedingly important in their role as zooplankton in the aquatic food chain – so important, that without them the aquatic food chain would cease to work. Talk about a mouse that roars, eh? One of our local species of cladoceran (sounds like one of the Star Trek aliens, doesn’t it?) is the Daphnia. 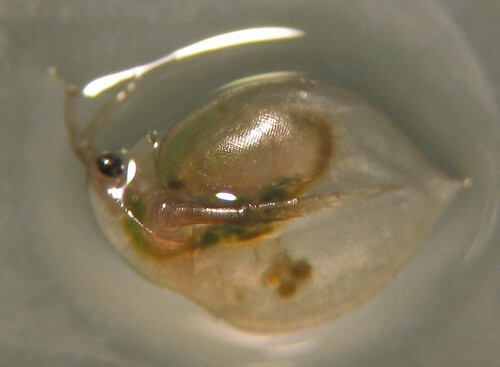 Looking at a Daphnia means looking at a little glass seed with an eyeball (see below). Relatively huge by micro standards, this type can be over 3 mm in length. The head end is evident by the presence of a single eye which, in reality, is a collection of eyeballs compacted into a cluster. When viewed from above (see here) the solitary eye really stands out. Two specialized antennae stick out from just behind the head and they are employed as swimmerets. The whole body is encased within a clear two part shell which opens along one edge. Internally they have nothing to hide since they live in glass houses (and therefore don’t throw stones). A dark green central intestine is evident along with a set of flapping gill feet. The gills keep water circulating toward the mouth for a constant diet of one-celled plants. A powerful “jumping foot,” called a post abdominal claw, helps the creature move along underwater surfaces and to deliver winning goals during their occasional planktonic soccer games. All of these features are visible in this short video clip (see here). Perhaps the most obvious feature are the eggs carried in a brood patch along the back (see in this view and a detail view here). Every single individual has them because every single individual is a pregnant female. There are no males at this time of year. The eggs are parthenogenically produced – which is a fancy way to say that they develop without the benefit of male fertilization. I’m not quite sure how to say this, but the spring explosion of daphnia consists entirely of amazons. 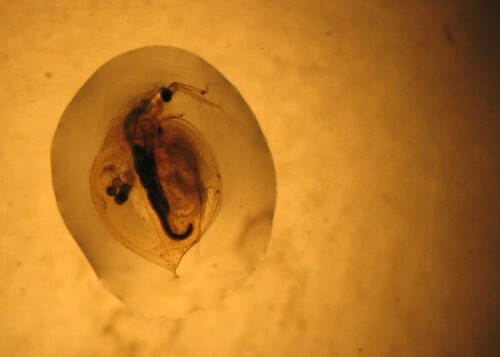 The eggs develop within the body and become fully fledged cladoceranets before they are released onto the world. As the summer approaches, a few of the females will decide to produce a few males, you know, just for the heck of it. They’ll have their little romantic get-togethers and then lay sexually produced resting eggs for the winter season. For now, however, it’s time for the girls to have a big p-a-a-a-r-t-a-y while making their own kids and eating algae until they get sick. True, most of them will get eaten before the spring fling is over, but such is the way of explosive life.